Left: Popolopompom by Dominique Baillot, france, 2001. Right: How Quest Sought the Truth by Nathan Jurevicius, Australia, 2001. Left: Spacemen in Distress by Pierre La Police, france, 2001. 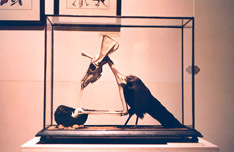 Right: Exhibition of Jan & Eva Svankmajer.